135 feet or lower limbs are amputated in England every week because of diabetes. But 80% could be avoided if people knew about the risk sooner. Diabetes UK wanted to raise awareness of this issue and encourage a hard-to-reach demographic to better understand and manage their personal risk of type 2 diabetes. People more readily engage with retail promotions than healthcare messages. So we hijacked an activity they're interested in to deliver a surprising message about the dramatic impact of unchecked diabates. Feature the shoes of people who had lost a foot to diabetes in an unexpected setting: a retail outlet. Capture the reactions of customers on hidden cameras as they discovered the shocking truth about diabetes and then share this content throughout the year via Diabetes UK channels. Provide shoppers with an opportunity to take advantage of a free diabetes health assessment to understand personal levels of risk. 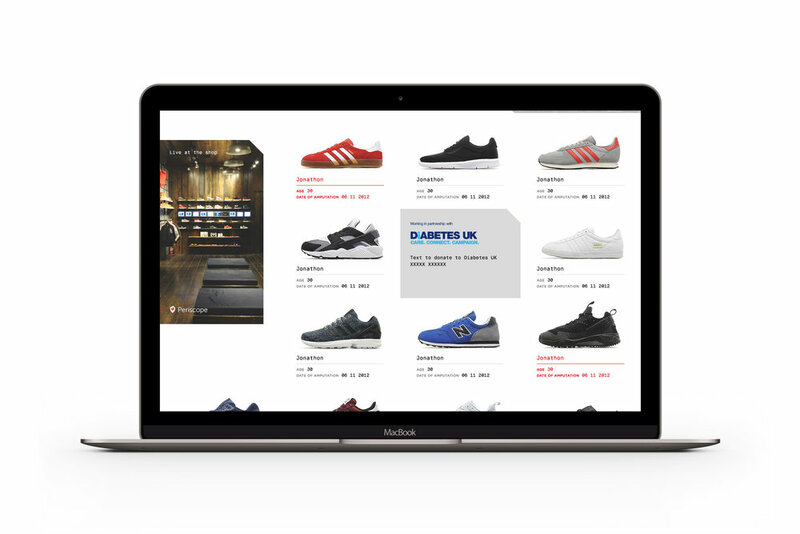 Ensure the message reached as wide an audience as possible by developing an online platform that mirrored the in-store experience and seed via the #oneshoeselfie social media campaign.